I had a spirited Jazz Night Out when I saw Columbus Jazz Orchestra’s “New Orleans On Parade” on Saturday, October 22nd at the Southern Theatre. The “Swingin’ with the CJO” season opener brought a variety of New Orleans jazz flavors to the stage via the talented orchestra and special guests Evan Christopher and Jamison Ross. Artistic director Byron Stripling led the charge early with his trumpet and voice on classics like “Bourbon Street Parade” and “Saint James Infirmary,” with help from selected soloists. Clarinetist Christopher was featured in the first half, educating the audience on the Big Easy’s clarinet pioneers and lending his own dancing exuberance to tunes like Ellington’s “Mood Indigo.” Bobby Floyd closed the first half with a barnstorming take on “Battle Hymn of the Republic,” providing his own revue of New Orleans styles with simply his piano. Drummer/vocalist Ross came on after intermission and hit the ground running with a take on “Summertime” that showcased his percussion and vocal skills beautifully. “Bye Bye Blues” was a soulful duet between Ross and Floyd on organ that expanded into a warm gospel romp. Christopher soon rejoined the proceedings for a fiery duet with trumpeter Dwight Adams on a tune that later featured an extended duo of Christopher and Ross trading bars. After Ross performed his original passionate R&B-flavored tune “These Things You Are To Me,” the program ended with “Saints Go Marching In.” CJO drummer Bob Breithaupt returned to the stage for a two drum set attack, and the ensemble exploded with blazing solos and Stripling blowing while standing on a chair! This was a fantastic way to start the new season, and the audience responded with numerous standing ovations! Saturday, November 5th and Sunday, November 6th: 20th Annual Denison Jazz Guitar Festival, Burke Recital Hall, Denison University. Granville will play host to myriad world-class guitarists this weekend for the 20th annual installment of director Tom Carroll’s Jazz Guitar Festival. Saturday will start with clinics from 1 to 4:45pm including a Q&A with featured performers (more details here). The festival’s first concert will take place at 7:30pm that night, presenting jazz guitar legends Gene Bertoncini and Bucky Pizzarelli, with a special appearance by Tom Carroll’s Organic Chemistry. The concert will be followed by a jam session led by Tony Monaco and Louis Tsamous with guitarist Chris Buzzelli and clinicians. 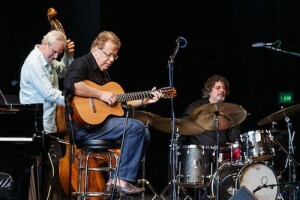 The second concert, Sunday at 7pm, brings Brazilian jazz heroes Trio da Paz to the stage to “redefine Brazilian Jazz with their harmonically adventurous interactions, daring improvisations and dazzling rhythms.” The night ends with a Grand Finale jam session. All concerts are FREE, so strum over to Denison for the finest in jazz guitar! We will be playing contemporary arrangements and artists at Brothers Drake! Artists such as Vulfpeck and Ben Williams. A healthy mix from swing to funk. This is my first show as a leader in Columbus! I formed the Quinntet over the summer back home in Chicago and I had a blast, so I knew I had to bring it here during the school year. I’m so glad I get to share the stage with some of my close friends, who are also my role models. Thursday, November 10th (6 – 9pm): Peter & Will Anderson Trio at The Refectory. The young NYC-based, Juilliard-trained woodwind masterminds and twin brothers return to Columbus to perform in the intimate Jazz Dinner Series at the Refectory. Joined by guitarist Alex Wintz, the trio reinvigorates classic jazz standards and more modern material with exquisite musicianship. If you haven’t experienced the series yet, this would be an excellent time. Click here for details on reservations (which are required) and the menu, or call (614) 451-9774. Previous post: Jazz At The MAC: "The Music of Bob Allen"